Akinsete, A., Famoye, F. & Lee, C. The beta-Pareto distribution. Statistics 42(6), 547-563, 2008. Barreto-Souza, W., Santos, A.H.S. & Cordeiro, G.M. The beta generalized exponential distribution. Journal of Statistical Computation and Simulation, 80(2), 159-172, 2010. Chen, G., Balakrishnan, N. A general purpose approximate goodness-of-fit test. Journal of Quality Technology, 27, 154-161, 1995. Cordeiro, G. M., Lemonte, A. J. The Beta-Birnbaum-Saunders distribution: An improved distribution for fatigue life modeling. Computational Statistics and Data Analysis, 55, 1445- 1461, 2011. Doornik, J. A. Ox 6: Object-oriented matrix programming language. 5th ed. London: Timberlake Consultants, 2009. Eugene, N., Lee, C. & Famoye, F. Beta-normal distribution and its applications. Communications in Statistics - Theory and Methods, 31, 497-512, 2002. Famoye F, Lee C, Olumolade O. The beta-Weibull distribution. Journal of Statistical Theory and Applications, 54, 121-36, 2008. Gradshteyn, I. S., Ryzhik, I. M. Table of Integrals, Series, and Products. Edited by Alan Jeffrey and Daniel Zwillinger, 7th edn, Academic Press, New York, 2007. Gupta, R.C., Gupta, P.L. & Gupta R.D. Modeling failure time data by Lehman alternatives. Communications in Statistics-Theory and Methods,27, 887-904, 1998. Gupta, R.D. & Kundu, D. Generalized exponential distributions. Australian and New Zealand Journal of Statistics, 41, 173-188, 1999. Jones,M.C. Families of distributions arising from distributions of order statistics (with discussion). Test, 13, 1-43, 2004. Kenney, J. F., Keeping, E. S. Mathematics of Statistics (3rd ed. ), Part 1. New Jersey, 1962. Lemonte, A. A new exponential-type distribution with constant, decreasing, increasing, upside-down bathtub and bathtub-shaped failure rate function. Computational Statistics and Data Analysis, 62, 149-170, 2013. Lee, E.T. Statistical Methods for Survival Data Analysis. Wiley: New York, 1992. Lee, E.T., Wang, J.W.Statistical Methods for Survival Data Analysis, third ed. Wiley, New York, 2003. Lee, C., Famoye, F. & Olumolade, O. Beta-Weibull distribution: Some properties and applications to censored data. Journal of Modern Applied Statistical Methods, 6(1), 173-186, 2007. Moors, J. J. A. A quantile alternative for kurtosis. Journal of the Royal Statistical Society (Series D), 37, 25-32, 1988. Mudholkar, G.S., Srivastava, D.K. & Freimer, M. The exponentiated Weibull family: A reanalysis of the bus-motor-failure data. Technometrics, 37, 436-445, 1995. Nadarajah, S. The exponentiated Gumbel distribution with climate application. Environmetrics, 17, 13-23, 2005. Nadarajah, S., Haghighi, F. An extension of the exponential distribution. Statistics: A Journal of Theoretical and Applied Statistics, 45, 543-558, 2011. Nadarajah, S., Kotz, S. The beta Gumbel distribution. Mathematical Problems in Engineering, 10, 323-332, 2004. Nadarajah, S., Gupta, A.K. The beta Fréchet distribution. Far East Journal of Theoretical Statistics, 14, 15-24, 2004. Nadarajah, S. & Kotz, S. The beta exponential distribution. Reliability Engineering System Safety, 91, 689-697, 2006. Pescim, R.R., Demétrio, C.G.B., Cordeiro, G.M., Ortega, E.M.M. & Urbano, M.R., 2010. The beta generalized half-normal distribution. Computational Statistics and Data Analysis, 54, 945-957, 2010. Rényi, A., 1961. On measures of information and entropy. Proceedings of the fourth Berkeley Symposium on Mathematics, Statistics and Probability, 1960, 547-561, 1961. Rigby, R. A., Stasinopoulos D. M. Generalized additive models for location, scale and sahpe. Journal of the Royal Statistical Society: Series C (Applied Statistics), 54, 507-554, 2005. Shannon, C.E. Prediction and entropy of printed English. The Bell System Technical Journal, 30, 50-64, 1951. ISNAD Dias, Cícero R. B. , Alizadeh, Morad , Cordeiro, Gauss M. . "The beta Nadarajah-Haghighi distribution". 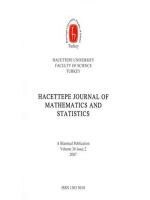 Hacettepe Journal of Mathematics and Statistics 47 / 5 (October 2018): 1302-1320.